At Lifebushido your unique ability is very important. Defining your unique ability starts with understanding yourself. Your unique ability will come to you easily. It will be something that you find fun, easy and that motivates you. It is important that you find your unique ability so that you can start to work with it. Using your unique ability in your work will let you find your niche. You will be able to focus your energy better and you will actually love what you do. Your unique ability is more than just a skill. It is your passion. Once you discover your unique ability you will find anything is possible. To make writing your goals easier you should focus on five goal categories – health, relationships, finances, business and personal. Every goal you can create should fit into one of these categories. Using the five goal categories can help to get you thinking and focused. Just having the ideas of categories can make it easier to come up with goals. Having just one goal in each area is a great start. You will have all the major areas of your life covered and be ready to start working towards your goals that will improve your life. We are living in exciting times where our country is changing and growing. With the inauguration of Barack Obama as our first black president this country made history. It is hard not to get caught up in the excitement. Take advantage of this amazing time; anything is possible. Put your goals in reach by just allowing yourself to believe that you can do anything you want to do. Stop and take a moment to relish this historic accomplishment. Think about how long it took for country to reach this point. Think about all the people who never gave up on their dream. Think about President Obama. 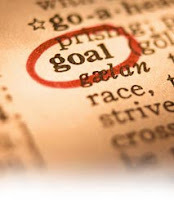 What is your goal? Are you holding yourself back from reaching your goal because of negative thinking? Shed those negative thoughts and start dreaming big. Anything is possible.